International speaker, lecturer, specialist teacher, parent and expert in dyslexia and specific learning differences (difficulties), Carolina Frohlich is an award-winning author of "Dyslexia: Time For Talent" (The Ultimate Guide for Parents and Children). Along with her many years of working with and supporting parents, children, adults and teachers, Carolina overcame her own dyslexia and used coping strategies and motivational techniques to inspire her own children who have dyslexia and that of her students. Carolina is passionate about maximising children's achievement potential: every child has a special talent that is bursting to be acknowledged. "Understanding our children's frustrations and giving them the tools to blossom will give them the confidence to reach their true potential." Carolina is also the successful author of the High and Medium Frequency spelling workbooks: My Spelling Books 1 and 2 (I can Spell), used by schools and parents to improve spelling ability, available on Amazon. 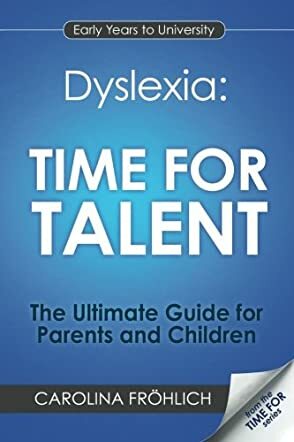 The book Dyslexia: Time for Talent by Carolina Fröhlich is written from the perspective of a person with dyslexia, a parent with dyslexic children, and a support teacher for pupils with dyslexia. The author is all of the above and through this book she proves to be a great story teller, a talented writer, and a thorough researcher. The book offers in-depth information about various aspects of what it means to have dyslexia, including the identification of struggles with reading and writing in children, different approaches and learning techniques, getting an assessment, offering children the right support and building up their self-esteem. The main idea of the book is that dyslexia is not a condition that someone needs to be “cured” of, it is only a different way of learning. Through a personalized teaching/learning approach, every child with dyslexia can find his own talent and become a successful adult. Dyslexia: Time for Talent is a well-written and well-documented book, very informative and useful for parents and teachers alike who work with children with dyslexia. Every problem has a solution and this is illustrated through charts and examples from Fröhlich’s own experience as a parent with dyslexic children. The author also emphasises that every dyslexic child is different and parents and teachers should identify what their strengths and weaknesses are so they can adapt the teaching methods accordingly. Learning through art, music, or sports are just a few examples of such methods. But the book doesn’t stop at primary school years; it also offers advice on how to deal with the condition in later years too, from secondary school and further education to learning to drive and getting the relevant career advice. As there are still people that are diagnosed later in life, I found those chapters extremely useful. This is the kind of book that should be in every household with a dyslexic family member, so it can be consulted at any time.